O Lord, born of the Virgin, do not look upon my sins, but cleanse my heart, and make it a temple for your most pure Body and precious Blood. Do not cast me away from your presence, for you are merciful without limit. Glory to the Father, and to the Son, and to the Holy Spirit. How can I approach and partake of your holy mysteries, for I am unworthy; and if I come to your wedding feast without the proper garment of worthiness of heart, I would but earn my condemnation. However, you, O Lord, are able to cleanse my soul and call me to the table of salvation. For You are the Lover of us all. Now and ever and forever. 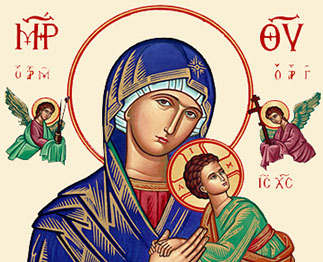 Amen O Mother of God, great is the number of my sins, but I hasten to you, seeking salvation; visit my soul in its weakness and pray to your Son our God to grant me the forgiveness of my evil deeds. For you alone are truly blessed. O Lord my God, how well I know that I am unworthy that You should enter into the temple of my soul. But I pray You, as You humbled yourself and became man for our sake, now also be patient with my lowliness. As You did not refuse to enter the house of Simon and dine there with sinners, now enter the abode of my humble and sinful soul As You did not reject the sinful woman who approached and touched You, in like manner, do not reject me, a sinner, as I come to You and also touch You. Grant that I partake of Your most pure Body and precious Blood for the health of my soul and body, for the remission of my sins, for my protection against attacks of the devil, for the increase of Your divine grace, and for the inheritance of Your heavenly kingdom. I pray You, O gracious Lord, sanctify my soul and body, and make me worthy to stand at Your right with all Your saints. Amen. Glory be to the Father, and to the Son, and to the Holy Spirit, now and ever, and forever. Amen. O Most Holy Trinity, have mercy on us; O Lord, cleanse us of our sins; O Master, forgive our transgressions; O Most Holy One, come to us and heal our infirmities for your Name's sake. Glory to the Father, and to the Son, and to the Holy Spirit, now and ever, and forever. May the partaking of Your Holy mysteries, O Lord, be not for my judgment or condemnation, but for the healing of my soul and body. O Lord, I also believe and profess that this, which I am about to receive, is truly Your most precious body and Your life-giving blood, which, I pray, make me worthy to receive for the remission of all my sins and for life everlasting. Amen. O Lord and Master of my life, spare me from the spirit of indifference, despair, lust for power, and idle chatter. Instead, bestow on me, your servant, the spirit of integrity, humility, patience, and love.